An emphatic result took place for owners and exclusive licensor of media content and copyrights in Egypt when one of the largest compensatory awards made in the Middle East region was issued by the Economic Court of First Instance in Cairo (EC), with reference to the non-payment of royalty fees and the imposing of liquidated damages. One of the leading broadcasting companies, enrolled into numerous license agreements with a broadcasting channel in Egypt in order to broadcast licensed and exclusionary material in terms of TV titles and series. The Egyptian broadcasting channel disregarded the payment of its royalty obligations, provided in the license agreement; therefore, the company filed a suit before the EC claiming an estimated four million USD for the recovery of the outstanding amounts due as well as two million USD of liquidated damages for the breach of the copyright licensing contracts. The contract binding both parties mentioned that the governing law for any disputes should be the UAE civil transaction code. The Egyptian court implemented the UAE regulations without any repressions and ordered the Egyptian channel to pay the demanded amount (four million USD). As for the liquidated damages, the UAE civil transaction code stated that it is up to the court’s discretion whether to waive, alter or conform to this type of damage in proportion to the breach committed by the other party. The court then reached a verdict and ordered the Egyptian broadcasting company to pay a sum of two million USD, the amount mentioned in the contract between both parties. This not only means that the Egyptian courts are progressing toward the benefit of owners of Intellectual Property Rights, but this is also a message from Egyptian Courts articulating that it will not hesitate to inflict large amounts of compensation through the contractual rights. In light of Egypt’s recent financial and development project, “The New Egypt », it is apparent that Commercial courts in Egypt are developing in the favor of the owners of intellectual property rights. This is a significant step when it comes to sustaining and preserving economic growth in the country. Egyptian courts can and will aim to intervene with high compensations in order to protect foreign investors’ rights in Egypt. New Regulations for Investment, Guarantee and Incentive Laws Egypt’s Prime Minister has recently issued a decree, no. 1820 of 2015, modifying Investment, Guarantees and Incentive laws. Said modifications have been introduced to ease foreign investment and to increase competitiveness in the Egyptian investment climate. One of the many changes that took place is that the Financial Control Authority now have the right to issue a decision to regulate the rules, conditions and procedures of any factoring activities and Monetary Supply with the aim to accommodate foreign and local investment. Furthermore, it is now possible to convert your company’s capital from EGP to any free exchangeable currency through specific procedures and applications. On the same basis, regulations and standards comparing applicants have been added and the availability of the required permits shall be granted based on the the company’s total investment, background experience and the kind of technology used. It is also to be noted that certain articles have been amended to support the aforementioned motive of these modifications. According to Article 31, appeals challenging the decree of tax exemption cancelations must be submitted within 30 days of the decree’s issuance. While Article 35 now states that unified custom class on machines, equipment, devices and production lines are now 2% rather than 5%. Another significant amendment occurred in Article 40; transient goods are now exempt from fees when imported into the free zones. This decree also took the opportunity to add new chapters of legislation and which further support the investment culture that Egypt is aiming to implement in the near future. A new chapter on Investment Policy was issued and it discusses the methods of application through the free zones, as well as the licenses, rules and regulations required for establishing in said zones. In addition, a new chapter on Land and Real Estate regulations indicates that the administrative authorities are now obliged to submit detailed maps to the general authority in order to ease related investments. These maps must identify the lands’ estimated value as well as which lands are up to the Republic’s standards in terms of fulfilling investment criteria. Finally, an alternative method to challenge the General Administrative Authority for Free zones and Investments’ decisions has been imposed. Formerly, the authority used to be the litigant and the judge. Now, with the presence of a neutral committee, GAFI’s decisions are now regarded as comprehensive decisions. Eldib & Co, Egypt’s most experienced full service law firm, has announced the promotion of four new partners. Mostafa Eissa joined the firm in 1988, and he has assisted in both the patent and trademark departments before specialising in patent registration. In cooperation with our IP division, Mostafa assisted in the development of several applications that modernise and simplify the annuities payments and processing for patents. Mostafa mainly handles prosecutions, oppositions, filings at the Patent Office, and appearing before the Patent Office to secure the client’s best interest. Mostafa now heads Eldib & Co’s Patent Department. Dina Eldib joined the firm as a qualified trademark agent in 2011. She brings to the firm her strong background in economics, advertising, brand management and new media solutions as well as her global knowledge of branding and corporate identities. She is responsible for the registering of trademarks and industrial designs. Dina handles many trademarks for multinational companies and assists with the registration of marks and the negotiations of deals pertaining to IP rights both locally and internationally. Marwan Eissa joined Eldib & Co in 2009, specialising in the field of Intellectual Property where he has extensive experience handling high profile multinationals. In the field of IP law, he is able to provide legal support, conduct clearance trademarks’ searches and investigations, register national and international trademarks, deal with refusals and oppositions of registrations, and file appeals/oppositions and counter-statements. He acts as an advocate and trademark attorney for major clients, small businesses, corporations, and multinationals. Mohamed Wahba joined Eldib in 2000 and became the head of Criminal litigation department in 2004. Mohamed was admitted before the Egyptian Court of Cassation in 2010. Since joining Eldib, Mohamed has dealt with a wide range of business crime matters. He has particular expertise in criminal cartels, extradition, corruption, mutual legal assistance. Mohamed handled high-profile cases for different individual and multinational clients within his areas of practice which includes: Criminal appeals, criminal defence, drug crimes, felonies, forgeries, misdemeanours, money laundering, and weapon charges. Please join us in congratulating our new partners for their immense efforts. Kuwait – New 2016 Official fees for the Enactment of Trademarks In the wake of the new year, the Kuwaiti Trademark Office have decided to implement the new official fees for all Trademark procedures as per their December circular, 13/2015. These developments and application of new fees are results of the 33rd Summit for the Supreme GCC Council, in their attempts to implement a unified GCC Trademark Law. However, it is important to note that the GCC Trademark Law exists only to unify the procedures across the GCC States. Said decree was published and released in the Kuwaiti Official Gazette on 27 December, 2015 and is the applicable decree for all trademarks filed on this date as well as retroactively pending applications. Eldib & Co invites you to send all your queries, in regards to Kuwait or any other jurisdiction in the MENA region, to mail@eldib.com. 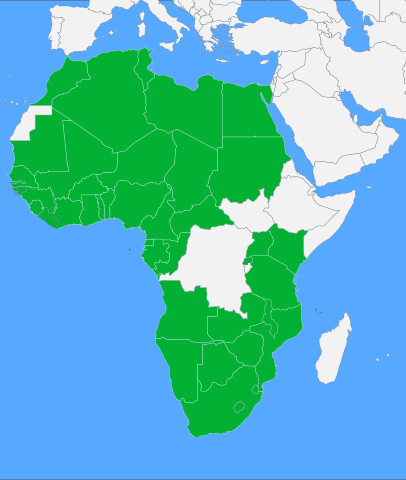 Algeria, Angola, Benin, Botswana, Burkina Faso, Cameroon, Central African Republic, Chad, Comoros, Congo, Egypt, Equatorial Guinea, Gabon, The Gambia, Ghana, Guinea, Guinea-Bissau, Ivory Coast, Kenya, Lesotho, Liberia, Libya, Malawi, Mali, Mauritania, Morocco, Mozambique, Namibia, Niger, Nigeria, Rwanda, São Tomé and Príncipe, Senegal, Sierra Leone, South Africa, Sudan, Swaziland, Tanzania, Togo, Tunisia, Uganda, Zambia and Zimbabwe. In recent years, Africa has faced numerous challenges, and is still facing difficult times; however, the continent still poses an investment destination. This year, the African Economic Summit took place in the Red Sea’s coastal city of Sharm El Sheikh in Egypt, between February 19th and 21st, 2016. « Africa 2016 » hosted 1,200 delegates who discussed how to attract private sector opportunities and build a 26-nation free trade deal signed last year to establish a common market. Delegates, for two days, discussed pushing forward the economy of the continent that accounts for 2% of world trade, despite having an economic growth rate of more than 4%. Eldib & Co attended the grand event at Sharm El Sheikh, where they were one of a select few law firms attending from Egypt. The forum was aimed at « pushing forward trade and investment in our continent to strengthen Africa’s place in the world economy », Egyptian President Abdel Fattah El Sisi said during his opening remarks. President Abdel Fattah El Sisi said that the conference aimed to present investment opportunities in Africa and create a direct communication channel between African businessmen and overseas investors. Promoting investment is one thing that will lead to extending Eldib & Co’s services to new areas of practice and fields. This will allow Eldib & Co to extend their services to potential investors who would like mergers or acquisitions or consultation regarding contracts from different countries within or outside the continent. « Africa 2016 forum is expected to position Egypt as a gateway for foreign investments into African markets, » Omar Ben Yedder, a member of the organizing committee, told AFP. There are high hopes that African investors lead the growth process through developing the continent’s infrastructure. « When our own people invest then other investors get convinced, » said Sindiso Ngwenya, head of COMESA. The private sector’s role will be very important in addressing energy challenges, where 645 million people in the continent do not have access to electricity. « We plan to invest 12 billion dollars in the energy sector over the next five years… so that people in Africa can have universal access to electricity, » Africa Development Bank president Akinwumi Adesina said. Africa’s economy is expected to grow 4.4 percent in 2016 and 5% in 2017 versus 3% growth expected in developed countries.